Growing Monarch Butterfly at Home. 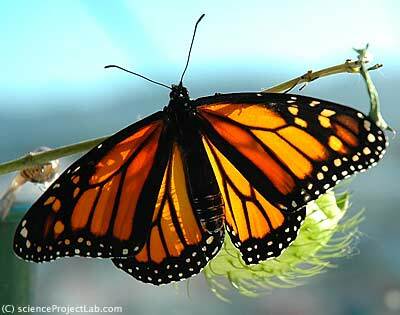 Monarch butterfly is a great subject for early grades science project on insect development. It's areal covers most of the North America, and it was introduced in Australia and New Zealand in 19th century. Monarch butterfly also known as milkweed butterfly probably the most famous of all butterfly species. It's top traveler among all known butterfly species. During the lifetime it can fly thousands of miles from the place where it hatched. Every year monarchs make a seasonal travel from Florida to north and west of US. There is the monarch butterfly watch project open for everyone. It's great summer activity. You can also study butterfly life cycle as an individual summer project (and cover yourself for biology science fair). A few facts about Monarch Butterfly. Scientific name of the butterfly is Danaus plexippus. It belongs to subfamily Danaidae of family Nimphalidae. Unlike other butterflies all Nimphalidae have only 4 fully developed legs, two front legs are reduces and folded to the body so it's hard to see them. Monarch is poisonous, but it does not produce poison. It stores it from food. Monarch caterpillars eat poisonous swamp plant (or swan plant in Australia and New Zealand) and keep poison in their bodies. It's interesting that as many other poisonous insects monarchs developed yellow and black colors for it's color scheme. Do they have agreement with bees and wasps? Caterpillars are also black with bright yellow and white stripes. Monarch's home is the milkweed plant from the Asclepias family. In US it's Asclepias incarnata and in Australia and New Zealand it's Asclepias fruiticosa. You'll need a swamp plant to feed a caterpillars. You can grow one or if it's available buy one in the gardening shop. Put it outside and wait. 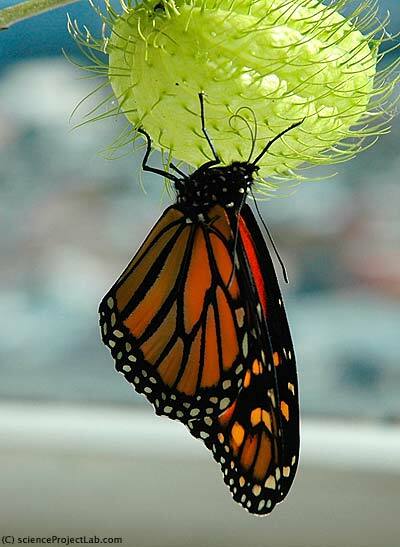 If there are monarchs in your area they find your plant and lay some eggs on it. Check the plant regularly to see if there are eggs or caterpillars on it. Hatched caterpillars first eat their egg shells and then start eating your plant. You don't want too many caterpillars on one plant as they will finish it off before they grow old enough to form a chrysalis. As caterpillars grow their skin becoming tight. Insect's skin can not grow with the body and caterpillars are not exception from the rule even though their skin look soft. 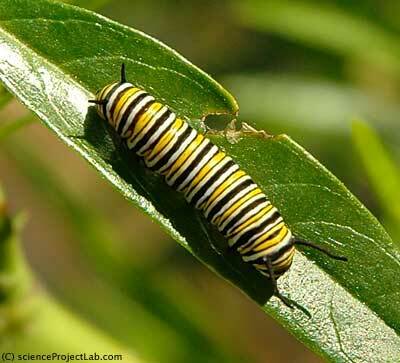 Monarch caterpillars shed their skin five times. 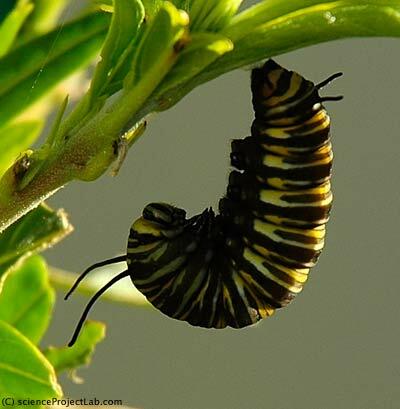 When caterpillar is ready to turn into chrysalis it attached itself to the plant stem with silk. Then the metamorphoses begins. It's quick and dramatic change of the whole caterpillar's body. 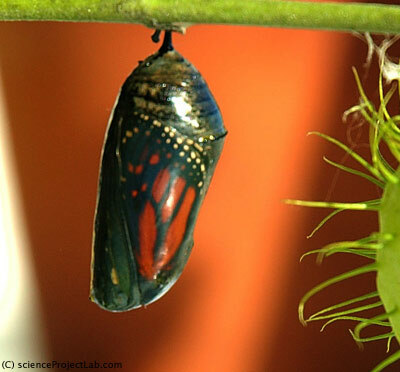 Chrysalis is the metamorphosis result. You can see wings outline and belly segments "engraved" on chrysalis shell. It's glossy and green and you can not see what happens inside. Try to use torchlight to see what's going on under the surface. One day before butterfly hatches chrysalis changes it's look again. It's surface becomes transparent and you can see fully formed butterfly sleeping inside. See through. You can see wings inside chrysalis shell. Bright sunlight can trigger hatching. It's quick process that takes only about 10-15 minutes so try to catch it. Chrysalis shell cracks in the middle and butterfly fells out, grabbing shell with the legs. Antennas and proboscis (it's mouth) packed in the special tubes attached to the front side of the chrysalis shell and butterfly may have hard time releasing them. On the photo below you can see that proboscis have two halves that stick together to form an empty tube that allow butterfly to drink nectar from the flowers. Newborn butterfly have one important thing to do - stretch its wings. 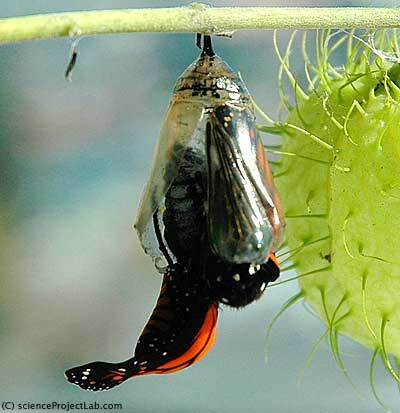 In chrysalis wings are tightly packed inside the shell so when butterfly hatches its wings are small and folded. It's using liquid stored inside its body to unfold them. It pumps liquid in the wings veins and unfold them. Wing's are very heavy and very soft at this point and butterfly should hold on the leaf or stem wings down and wait until they completely expanded and dry. 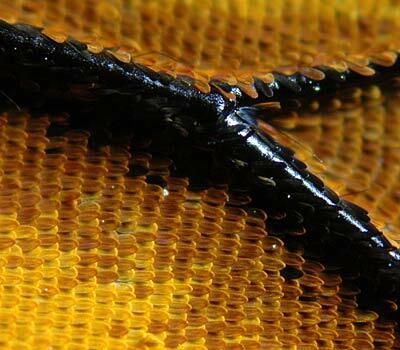 This is how monarch butterfly wing looks like under the microscope. It's 40x magnification. You can see "huge" black veins and tiny yellow scales. Scales cover the whole surface of the wing. Each scale can have individual color and they form the wing pattern , like pixels form image on your computer's monitor. Things to do if you grow the butterfly. When you work on your science project one of the most important things you should do is to write down your observations. Especially dates. When caterpillars hatched? Have you noticed them shedding the skin? How long does it take? How long caterpillar grow until it turns into chrysalis? What is the length of newborn caterpillar? Fully grown caterpillar? Write down answers to this questions and ask yourself more similar questions. What else can you study? Is it going to be any difference in development time for caterpillars that live on the plant that receive a lot of sun vs plant that stay mostly in the shadow? Will caterpillars grow in the total darkness? Do they sleep and if yes, what is their sleeping cycle? 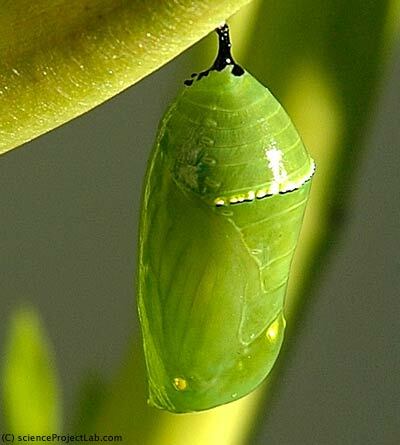 What happen if monarch chrysalis will be turned upside down? Will butterfly develop? If you have plenty of caterpillars, you can also decide to do an anatomical study and dissect caterpillars and pupae during development. Make sure you put them to sleep and do dissection under 10x binocular for better results.